On Tuesday, July 17 we headed south from Juneau down Gastineau Channel and into Stephens Passage. Our destinations this week include Taku, Endicott Arm, Dawes Glacier, Fords Terror, Windfall Harbor, the Pack Creek Bears and Petersburg. Our guest crew this week are Wild Blue veterans Jan, Jerry and Justin Watkins of Simi Valley, California. This is their fifth cruise with us. Once in Stephens Passage we noticed scores of commercial gill-net fishing boats along the east coastline. Gil-netters run a 3/8 mile long "curtain net" perpendicular to the shore. The net has larger openings so as fish swim by, the smaller fish pass through the net, but the bigger ones get caught. After a couple hours, the net is reeled aboard and the large salmon are plucked. Seeing all this fish, we decided to troll our our way along. We dragged herring and lures with flashers at various depths from 30 to 100 feet, but these fish just weren't biting, however they were busy getting caught up in nets! That night we moored at the public dock in Taku Harbor on the east coast of Stephens Passage. We set two crab traps among the 4 dozen or so commercial traps and hoped for the best. Once the commercial crab season opens in mid-June, the crabs get scarce. Lone boat in Taku Harbor. Two Wild Blue crew look for relics from the 1930's Taku Cannery. As we departed Juneau, a cruise ship came close to knocking us off course, but we held our own (NOT). On Wednesday we pulled out two legal male crabs, cleaned and cooked them, then continued south down Stephens Passage with light winds and little rain. We trolled Port Snettisham entrance without success and continued toward Tracy Arm Cove. Just before the left turn to Tracy Arm we noticed a nice looking anchorage under Point Coke. In the calm seas and winds the "cove" looked good so we dropped the anchor and a couple of fishing lines too. After a while, Jerry hooked a good sized fish which once landed turned out to be a 40 pound halibut. Later our cove got bumpy from passing cruise ships, so in the later evening we moved around the corner to Tracy Arm Cove anchoring with 8 other vessels. Jerry hooks a big one. Just fits in the net. Halibut is quickly packaged and frozen. The view from Tracy Arm Cove. On Thursday we started early up Endicott Arm for Dawes Glacier. It was a 4-hour journey to the glacier face. We dodged giant, large, medium and small ice bergs and lots of little "bergie bits". The face was interesting but stayed back about 1/4 mile. When the glacier calves, a large wave can be generated which reverberates for several minutes around the small confines in front of the face. We noted and photoed several seal families on the medium sized bergs. We collected glacier ice and filled our big cooler. Glacier ice is dense and seems to stay cold longer. We enjoyed that glacier tradition 15 over 15,000 -- whiskey aged 15 years, over 15,000 year old ice. At 2PM we motored near the entrance to Fords Terror and examined the rapids while waiting for slack water. Anytime other than slack water these rapids run fast and wild. They limit access much like a time controlled bank safe. Ford Terror resembles Yosemite with its high granite walls, waterfalls, green glacier water and lush summer vegetation. By 2:45, some 40 minutes after high tide in Juneau, we followed a couple kayaks through the shallow entrance into this pretty other world. It was raining and we set a couple prawn traps in 300 feet. We anchored in the northern arm in front of a picturesque waterfall and outflow that keep us near motionless. This old glacier has receded from the shore, leaving a nice cut in the granite. Harvesting glacier ice for the toast. The 15 year whiskey over 15,000 year old ice toast. Dodging "bergie bits" approaching Dawes Glacier. Seals and their young ones on an ice berg island. The killer whales don't travel up to the glacier so the seal moms have learned to raise kids here. Entering Fords Terror. It was more exciting exiting at 3AM! As pretty as it was, the crew could not see spending a full day inside Fords Terror in the dreary dark weather. Like the timed bank safe, you can only exit at high slack tide, or once each 12 hours or so. That meant tomorrow at 3PM the next "daylight" high tide. We thought some more and decided we could exit at the 3AM slack high, except it would be dark. But would it? Nights in summer Alaska aren't really that deep black dark. We pulled our prawn traps just in case we decided to leave in the early morning darkness and counted about 3 dozen worth....just enough for prawns in linguine. At 2AM Friday, we awoke after a 3 hour nap, pulled anchor and headed for the entrance. With Jerry and Pat on the bow watching for ice and dead trees we creeped forward making the entrance a bit late. The tidal current had already reversed and began pushing us at 3 knots. We rode this push out the entrance landing in a bunch of small ice bergs which were easy to see. We were on our way to Windfall Harbor in Sandborn Canal, and the Pack Creek bear observation facility. After a 9-hour motor we dropped the hook at Windfall. The sun was shining, the wind abated, and the water was glassy. Just right for a ....nap. Eagle over ice: No this is not a new cocktail. Lots of prawns in Fords terror. Windfall harbor lives up to its name. Windfall bear patrols the shoreline. We spent the rest of Friday lounging and prepping for the Pack Creek visit the next day. Prawns, garlic, olive oil, tomatoes and linguine put us to sleep again in that evening. On Saturday we drove the tender towards the designated unload area at Pack Creek and were intercepted by three Forest Rangers who briefed us before we became bear food. We landed with them and their armor of rifles and pepper spray. The water is shallow and the tides vary some 20 feet between low and high. So the tender was tethered to a pulley system and cranked out to deep water, so it wouldn't be high and dry when we chose to leave. The bears didn't bother us. In fact the mink wasn't bothered by us either, going for a swim just a few feet away and returning with a nice sized crab for his breakfast. After a safety briefing, we followed our guide to the estuary viewing area. After an hour or so, three bears showed up and displayed their fishing prowess. One 17-year old sow had a GPS collar that's been installed by the Forest Service for monitoring her location. Later that afternoon we trekked a mile inland to an observation platform above the Creek. There we were able to get close to the bears and record some interesting video. Our tender is pulled offshore in deeper water. Mink enjoys a crab after morning swim. Our Rangers were armed and ready for unruly Grizzlies. Observation platform 1-mile deep in the wilderness along side Pack Creek. Bears entering the Pack Creek Kill zone. Bear tastes one salmon then takes another. Active "collared" bear stomps on salmon for his dinner. On Saturday afternoon we left Windfall for Mole Harbor, about 10 miles south in the Sandborn canal to get us closer to the next day's destination. There Jerry landed a second halibut. Yes we know Oregon won the Rose Bowl, but that "V" is not for victory, or peace. This was Jerry's 2nd halibut. 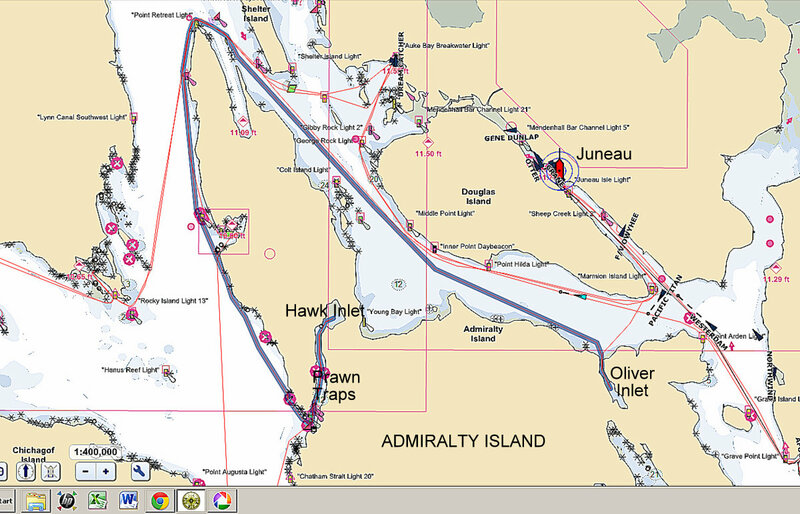 On Sunday we set course for Petersburg and the end of a great week of cruising in AK. On Friday our son Ryan and his fiance Cailin arrive for 10 days of fun in Alaska. Five Fingers Lighthouse is the last manned lighthouse in Alaska. Seals cling to the Petersburg turning mark. On the dock in Petersburg. Petersburg sea lion dines on salmon. On Friday, July 6th, our son Max and his gal Katie arrived from Chi-town (Chicago) for a week of Alaska cruising. Max is an Software Applications Consultant with Model N working at a client site in Chicago. Katie in a charter school teacher who has just taken a position as Master Teacher in a new charter school near Chicago. On Friday we provisioned the Wild Blue for all things that Max and Katie like including a bottle of smokey Laphroaig scotch, now among Max's new favorites. The plan is to go fishing on Saturday morning at local Biorka Island then do the Sitka Music Festival finale in the evening. One last fishing trip to Biorka. On Saturday, we rallied at 6AM for the 90 minute motor to Biorka Island for one last Sitka fishing experience. Katie and Max we amped up for landing a salmon and after a sloppy ride, we started trolling upon arrival. Pat, dressed in her morning crew uniform of pajamas and robe, drove the boat and Alex tended the poles. As soon as the lines were in, Max and Katie went below to layer up for the cooler weather. Within minutes the call of "fish on" had Pat stopping the boat. Alex reeled in the fish and with no other crew on deck, Pat had to net the salmon and haul it aboard, while carefully keeping the fish blood, slim and scales off her robe! The landing was a success and the rest of the crew made it up to see a 31 inch Silver salmon in the box. The excitement made the eager out-of-town fisherman even more eager. As we have said many times, salmon trolling is "many hours of boredom, punctuated by a few minutes of extreme excitement". Unfortunately Katie and Max spent a lot of time outside in the cold experiencing the boredom part. By noon we started back for the Harbor, cleaning the fish for Sunday's BBQ. Dinner and a musical performance: Max and Katie at the Larkspur in Sitka. Note Katie isn't really this tall. She sits on a stool here, teacher like, relishing a rare opportunity to tower over Max. After Saturday's memorable music concert at Sitka Harrington Hall with the Attacca String Quartet and super cellist Zull Bailey, we again rallied at 6AM Sunday for the cruise to the top of Kruzof Island. By 9AM we were trolling the so-called "shark hole" king salmon fishing spot just outside Peril Strait. With no bites, at 1PM we started up Peril Strait to make Surgis Narrows with the currnet in our favor. Sergis Narrows in Peril Strait is calm today even with 5 knots of current. The view looking north in Peril Strait. Dining on the Wild Blue greatly improves when our kids visit. Today's lunch menu included quesadillas with fresh made guacamole by Katie. Delicious! We moved over in skinny Peril Strait while the Fairweather Alaska Ferry sped by at 38 knots. 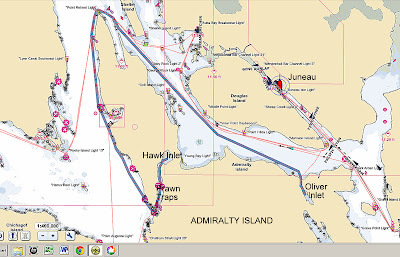 In early evening we pulling into Hanus Bay, on the southern side and near the east end of Peril Strait. We set two crab traps and started the BBQ. Fresh salmon sushi appetizers and BBQ salmon on a cedar plank highlighted a busy day in Alaska. The Chicago Tender Team examine Hanus Bay. Katie and Max this week's Wild Blue crew. On Monday we pulled our crab traps, returned the females and juveniles to the sea, and harvested 3 good-sized male crabs. Alex immediately prepared the crabs and dropped them in a boiling water seasoned with Pappys. We'll enjoy the crab meat later. After pancakes and bacon, we headed out of Peril Strait into North Chatham destined for Tenakee Springs, a small Alaska community on Chigagof Island. At Tenakee, there is free hot springs bathing and many homes in the town are heated by the hot water from the Springs. 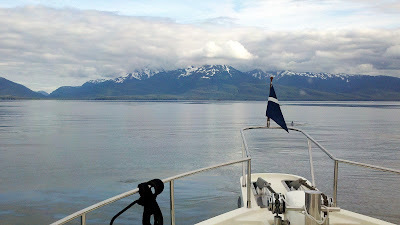 As we reached Tenakee Inlet, we noticed a small passenger ship following a group of humpback whales. We videoed the scene. Every home has an ocean view in Tenakee Springs. Max leads the Humpback whale chase. The Manuska is considered a slow Alaska ferry, traveling at just 15 knots. It continued to rain all day, so no one was driven enough to venture into downtown Tenakee. On Tuesday morning we continued our journey up Chatham Strait to Hawk Inlet. The wind and seas were up, 20 knots and 5 feet respectively, but with those and the current on our back, Wild blue easily surfed northward. After four hours we entered Hawk Inlet, avoiding the feeding Humpbacks, and set our prawns traps in deep water. We anchored in shallow and calm water 4 miles deep inside Hawk Inlet in what the Douglass Guide calls a "bombproof" anchorage. It was very quiet. The view from the bitter end inside Hawk Inlet. Hawk Inlet on Admiralty Island and Wednesday's route to Oliver Inlet. On Wednesday we started early to allow fishing time. After picking up and emptying our prawn traps, we trolled northward along the west side of Admiralty Island towards Juneau. Once again we experienced the boredom part of salmon fishing. 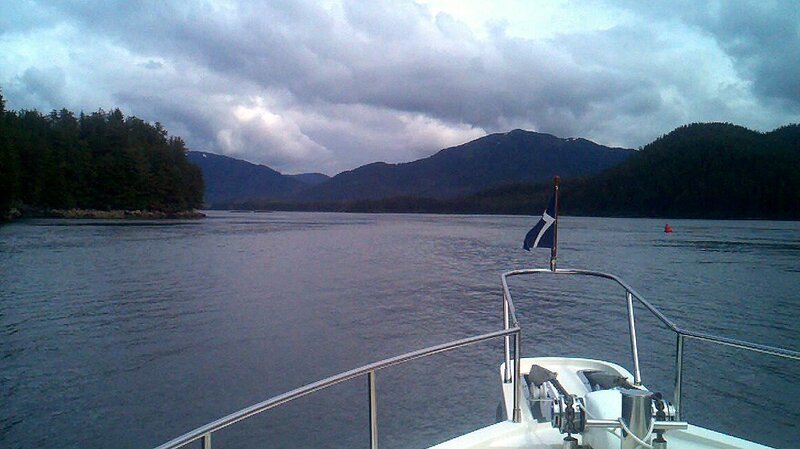 At last we needed to leave to make Oliver Inlet by 8PM high slack water. The Inlet is one of those that allows entry only at high tide. The Douglass Guide assured us that with today's 14-foot tide we will still have 8 feet under our keel at the shallow entrance. The Wild Blue Prawn Team in action. At 8PM, some 30 minutes after high tide, we entered Oliver Inlet with the flow inward pushing a 3-knot current. The depth was 5 feet less than the prediction, so either the entrance has shallowed since the Douglass' did their survey, or Coastal Explorer tide tables were incorrect. Either way there was 5 feet of depth missing and one of the three depth meters was reporting consistent 6.8 feet, or 1.2 feet of water under our keel! The other meters were recording 8.2 feet, or a little less than 3 feet under the boat's bottom. Not much of a reassuring feeling. We made it through the nearly 1-mile of shallow water and found a 30 foot deep anchorage area inside the Inlet. We felt much better after we consumed a quick Laphroaig on the rocks! (Oh no, don't say ROCKS). After the scotch it was time for a Wild Blue favorite: linguine and prawns. Yes we nabbed about 50 prawns, twisted their heads off and par-boiled and peeled them for insertion into the cooked linguine, crushed garlic, parmigiana cheese, sliced tomatoes, capers and olive oil just before serving. Wow! What an delicious epicurean experience. Linguine and prawns: a Wild Blue favorite! The birthday girl celebrates 25 years a few days early with Pat's chocolate and chocolate chip cake. Note the 2 candles and 2 candles in a row for those of you that can count. Two local "yakkers" pass us. One looks to be from San Francisco? On Thursday, the original plan was to exit Oliver Inlet on the 8:30AM high tide and make Juneau by noon for touring. However the morning hide tide was only +10 feet so that meant we would run aground on the way out. This of course would probably make Katie late for her new job, so we played it safe and waited for the 9:30PM high tide. This meant extra time inside Oliver Inlet, so we took a hike along the narrow gauge rail which serves as portage to Seymour Canal to the south. Then we kayaked around a bit and then one of use when swimming in the cold Alaskan waters. Enduring the cold Gulf of Alaska waters for a swim. A little after 9PM we hauled the anchor and cautiously exited Oliver Inlet. It was less tense than the entry and uneventful. We made course for Juneau passing two cruise ships leaving Alaska's capitol city. We entered the Harbor near dark, an appropriate ending to a great week of cruising. Cruise ship exiting Gastineau Channel and turning for Stephens Passage at 10PM. Entering Juneau Harbor at 11PM with plenty of light to see the docks. Although max and Katie had no luck fishing for salmon in the wild, this commercial seiner (a net boat) easily lands thousands of fish inside Juneau Harbor. Oh well. We had a fun time with Max and Katie. They make a good team. Hopefully they'll be back next year. 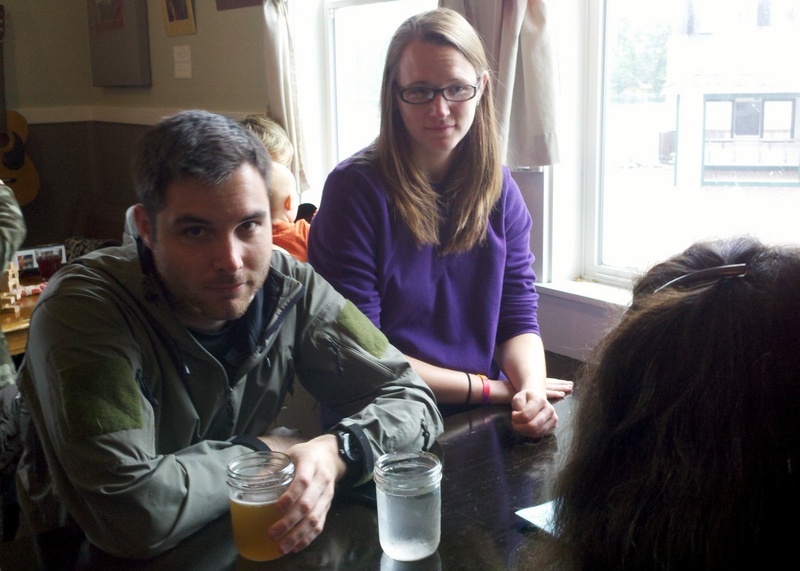 On Sunday, June 24 Alex's college roommates arrived in Sitka. Willie, Joe, Mike and Alex all graduated from Cal Poly San Luis Obispo in 1970-71. Willie Benedetti was a poultry major and now operates his own poultry business. Willie-Bird Turkeys in Northern California is just one of just four remaining independent turkey producers in California. Willie-Bird started as a high school FFA project. These days Willie's turkey's are distributed world-wide each Thanksgiving and Christmas by Williams-Sonoma. Joe Cebe, also a Cal Poly poultry graduate, operates Cebe Farms in San Diego County, a large six-ranch chicken operation. Joe developed a unique strain of bronze chicken which has become quite popular in the Spanish and Asian cultures. He ships his birds live to poultry markets throughout California. Mike Celentano operates a CPA practice that specializes in Audits. His practice is located in Northern California. Of course Willie-Bird is one of his many clients. As usual, Willie arrived in Sitka with a packed cooler: eighty pounds of fresh food including prawns, duck, Louisiana sausage, turkey bacon, smoked chicken, turkey steaks, and salad shrimp. Looks like Alex will be putting his vegetarian diet on hold this week. 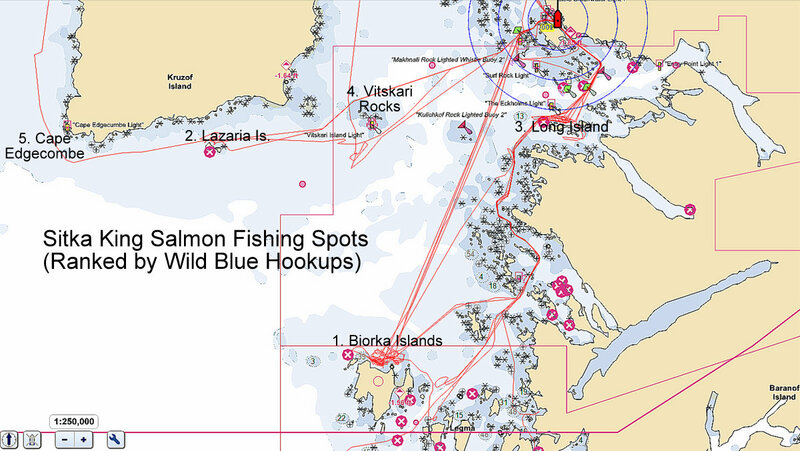 On Monday we began fishing the Sitka area for King Salmon. Alex had consulted the locals and built on his experience fishing the previous week aboard Spirit with the Gills. The best local fishing spots and fishing gear were recorded. On the lee side of Biorka Island we landed 3 Kings during the morning hours then spent the rest of the day trying for the 4th. Current 2012 Alaska regulations annual limit to 4 Kings per non-resident fisherman and one-fish per day per angler. Most of the time salmon trolling is hours-and-hours of boredom, interrupted with few minutes of extreme excitement. Such was Monday's fishing. Local Fishing Sitka Fishing Spots. Gear wise we are now using the longer, flexible trolling polls cranked down hard against the down-rigger weight. We find it much easier than shorter polls to detect and distinguish hits, as opposed to shakers, flasher wraps, weed, etc. The Shimano Charter Special reel is quite popular on other sports-fishers and we like the ease of adjusting break tension while reeling. We use hand crank Cannon down-riggers with 12 pound balls with trailing fin. The big Scotty, clips which are quite easy to use, attach line to down-rigger at the ball fin. We leave about 15 to 20 feet of line behind the ball. A green center-striped "e-chip" flasher has proven the best for us and others. We have only fished with frozen herring, clipped at the nose, with one hook through the body, and a second dangling hook. This has proven to be the best setup for us. Double hook mooch rig with nose clip has worked good. After trying various flashers, this particular "e-chip" flasher has proven quite successful for us and the Spirit crew. On Tuesday we again awoke at 4:30AM and by 6:30 were back at Biorka Island tolling along with 20 other boats. But Biorka turned against us and the bite was off. After 9 hours of boredom, dragging lines without a hookup, we retired back to the harbor. Willie put together a wonderful Louisiana style salmon-prawn gumbo. Miriam and Patrick from Spirit joined us. Served in real Abalone shell bowls, fabricated by Willie's son Arthur, the gumbo was excellent. It was accompanied by shrimp salad and BBQ duck breast. Louisiana Style salmon-prawn gumbo in an Abalone shell. On Wednesday we left Sitka early headed for Vitskari Rocks. The bite was immediately on and we landed one and lost one in 15 minutes. After just an hour, we headed north for Kalinin Bay at the top of Kruzof Island. At St John Baptist Bay we set two crab traps, watched a grizzly bear forage along the shore, and then began trolling near Kalinin. After 4 hours of no bite, we moved outside to a point just below Seal Lion rocks. The bite was off for the rest of the day. We returned to empty crab traps but enjoyed Willie's turkey spaghetti at anchor. This hungry grizzly can't wait for the berries to ripen and salmon to run. On Thursday we were behind the curve on landing our annual limit of 4 King salmon before the licenses expired on Sunday. We headed out to Sea lion rock and immediately landed a good sized King. After a quiet hour we began fishing our way down the ocean side of Kruzof Island. We landed a couple good sized Silver salmon. After fishing the outside for most of the day we rounded Cape Edgecombe with still just a lonely King in the box. The south westerly swell made trolling uncomfortable so we moved over behind Lazaria Island. Soon we landed two more Kings in the flat water in the lee of the Island. We ended the day at Sitka Harbor with seven down, five to go. On Friday after a midnight dinner of venison sausage, we dragged out of the sack early for another shot at Biorka Island. Suddenly at 8:15AM the bite was ON! By 8:45 we had landed 3 Kings, but lost another 5. We had both lines with fish on but in our excitement suffered from broken lines, too tight brakes, broken leaders. We were a little tough on Joe here. It doesn't pay to pull too hard! Three out of eight in 35 minutes! Bait balls filled the sonar off Biorka Islands. Cleaning the fish and eyeing salmon roe. Willie Benedetti of Willie-Bird Turkeys is a pretty good fisherman. On July 1st, our last day of fishing, he landed a pretty good sized fish and Willie, Joe and Mike fulfilled their Alaska Non-resident season limit of 12 King salmon in 7 days. Willie and Joe make sure the big King Salmon doesn't fall overboard. This 41-inch 30+ pound King fits nicely on our 42-inch long fish cleaning table. Willie lands the big one. Best Foods only ever since 1967! Moonlight night over Sitka, Alaska.